‌ In their paper published in Nature the physicists from the University’s College of Science, working with an international collaborative team at CERN, describe the first precision study of antihydrogen, the antimatter equivalent of hydrogen. Professor Mike Charlton said: “The existence of antimatter is well established in physics, and it is buried deep in the heart of some of the most successful theories ever developed. But we have yet to answer a central question of why didn’t matter and antimatter, which it is believed were created in equal amounts when the Big Bang started the Universe, mutually self-annihilate? It has long been established that any excited atom will reach its lowest state by emitting photons, and the spectrum of light emitted from them represents a kind of atomic fingerprint and it is a unique identifier. The most familiar everyday example is the orange of the sodium streetlights. Hydrogen has its own spectrum and, as the simplest and most abundant atom in the Universe, it holds a special place in physics. The properties of the hydrogen atom are known with high accuracy, and one in particular, the so-called 1S-2S transition has been determined with a precision close to one part in a hundred trillion – equivalent to knowing the distance between Swansea and London to about a billionth of a metre! 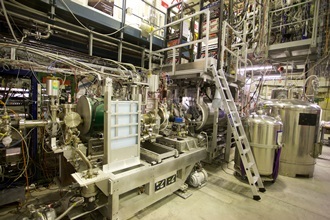 Now in these latest experiments, the team have replaced the proton nucleus of the ordinary atom by an antiproton, and the electron substitute is the positron. 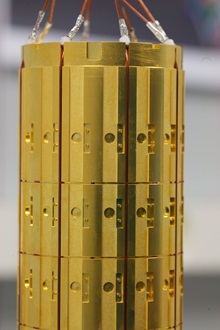 By shining laser light at a well-defined frequency onto antihydrogen atoms held in a trap, they have seen that some of them get excited to an upper level, and in so doing leave the trap. This very first experiment has already determined the frequency of the antihydrogen transition to a few parts in a tenth of a billion. Pictures courtesy of Professor Niels Madsen.